Ed weighs in. "Crickets" from Tulane on Jones Hall of Fame induction. Tulane athletics has started the new year with a missed opportunity. And, it was a big miss. Any coach with that résumé should at least get a mention from his university, don’t you think? But, as of late Sunday night, Jan. 8, there was no recent acknowledgment on the Tulane website. If you jog through the Tulane website, there’s a story dated July 26, with a press release announcement of Jones’ pending induction. But, since then, crickets. Where are the pictures from the induction ceremony? Where’s the video? Where’s the quotes from a baseball coach who won more than 800 games? Jones deserved better. tpstulane wrote: Ed weighs in. "Crickets" from Tulane on Jones Hall of Fame induction. Right. Can you even imagine LSU not recognizing Skip Bertman on his HOF's. Once again Tulane drops the ball on an easy promotion for the winningest coach in any sport in the history of Tulane. Roger Dunaway's job must have been eliminated because that was a no brainer. Not even a Tweet out of Tulane. It's almost as if they are purposely trying to whitewash the little success we did have in the past to keep the threshold for future success low. And Tulane complains about lack of media coverage what a joke that they can't even cover their own. He's just one of many knowledgeable baseball fans that are in agreement. sey what !!! !..RD is in the damn hall and not RJ !?!?! ?...how the F#@K does that happen ? I don't think RD is in. He got an award from the HOF I believe. an award...for what, incompetence ? Didn't say he deserved anything. I was just adding clarity. I boo'd loud and long at that game. The GB's had a surprise visitor last night. I bet this was completely planned and had nothing to do with the backlash they received. Congrats to Rick Jones selected to lead TOS Team USA 18U National this summer. Former Tulane head coach Rick Jones will also join the coaching ranks at the Tournament of Stars this year. Jones spent 21 years at the helm of the Green Wave program, where he tallied a 814-439-2 coaching record. His teams appeared in 12 NCAA Regionals, three Super Regionals and made it to the College World Series twice. He was also a part of three different Team USA coaching staffs. He managed the 2009 Collegiate National Team, was an assistant coach on the 1989 USA Baseball Presidential Cup staff and served as a member of the 1990 USA Baseball National Team coaching staff. 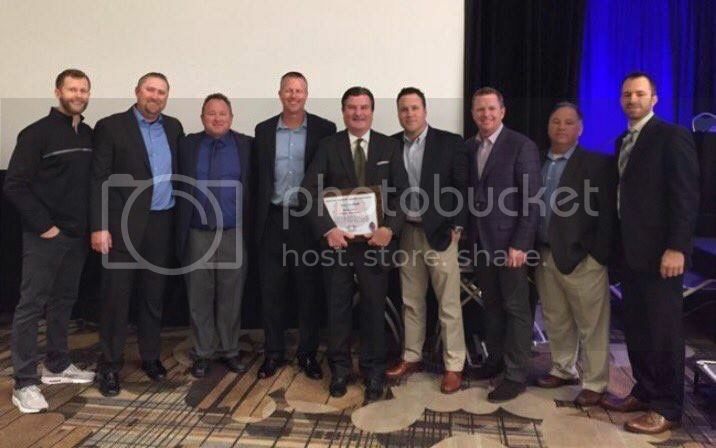 Earlier this year, Jones was inducted in to the American Baseball Coaches Association (ABCA) Hall of Fame. The team is comprised of around 80 of the best upcoming high school seniors in the country. Most have already committed. Many were committed to Vandy, Florida and LSU. None were committed to Tulane. C'mon man; where is your TU education ? It's Halls of Fame. Just as it's Times Out remaining, not timeouts. nawlinspete wrote: C'mon man; where is your TU education ? Ok cut me some slack. I majored in Finance not English. 6 D1 head coaches. I'm not sure that anyone has more at this point in time. That's incredible. Fun times. Had heard a lot of that before but hadn't heard about the ride back. There also was a private event held for Coach this past Thursday. Many players, donors, coaches and former co-workers attended. Rick told us many stories we hadn’t heard before. One in particular I’ll share. I’m going from memory so I’ll try to be as accurate as possible. He had just accepted the Tulane job and former coach Milt Retif was instrumental in being a part of it. Rick gets settled in and he wants to begin to recruit on a national basis. Once on campus he realizes his recruiting budget is a meager $3,500 for the entire year. So he picks up the phone and tells this to coach Retif. Milt tells Rick to give him an hour or so and he’ll see what he can do. Not long after he calls Rick back and tells coach, “I just raised $31,500 will that help”? And the rest is history. Many other stories were told and many others were thanked. Hopefully Tulane releases a video of Rick’s HOF speech Friday night. It was a great acceptance speech. Rick invited on WWL radio this Friday night 7:20pm. Going to talk memories of the Tulane LSU series. Should be some good stories. He's a class act, for sure. If you see him or talk to him, TPS, send my regards and thanks for talking to me when things were going the wrong way with Zach. He cares and that meant a lot to me. Tomorrow, Zach and Teddy turn 6, and we're going to party like we're in New Orleans!!! Zach is doing great and we have some serious cutting loose to do! He replied, “Please tell DT I appreciate his kind words and Zach is in my morning prayer time every day”. Rick going to be on WWL radio coming up.